With the first half of 2018 now drawn to a close, much of the financial medias’ headlines and commentary relating to the gold market has been focusing on the fact that the US dollar gold price has moved lower year-to-date. Specifically, from a US dollar price of $1302.50 at close on 31 December 2017, the price of gold in US dollar terms has slipped by approximately 3.8% over the last six months to around $1252.50, a drop of US $50. It’s been a choppy first half. After trading above $1,300 since the start of the year, prices ticked lower in mid-May and went into free fall two weeks ago, erasing the year’s gains. Investors shunned bullion and favoured the dollar and Treasuries instead as they weighed the uncertainties surrounding the impact of a U.S.-China trade war on global growth. Gold’s losses in June, driven by an ascendant dollar, have put the precious metal on course for its biggest monthly drop since November 2016, when markets were roiled by Donald Trump’s victory in the U.S. election. The metal dropped 3.6 percent in the month of July, while a gauge of the greenback is up for a third straight month amid escalating global trade tensions. Investors have moved to the US dollar as a preference choice for safe haven .This has benefited the dollar and weakened gold. It has indirectly led to gold-price weakness, as the dollar and gold typically move inversely to each other. With the emergence of inflation, gold is likely to find a bottom, as the dollar’s gains weaken. On the contrary, Suddenly, On Friday, gold finally gained support near $1245 after falling to a six month low. 1) U.S. Final GDP Disappoints – The gross domestic product was expected to grow at a pace of 2.2%, but the actual figure fell to 2%. Consequently, the weakness in the U.S. dollar underpinned gold. 2) EU Leaders Agreed on Conclusion – The Chairman of the talks, Donald Tusk said, “EU28 leaders have agreed on (summit) conclusions, including on migration”. In response to this news, the investors moved their investments from Greenback to Euro. Therefore, the Euro jumped over 0.7% on Friday and dollar index fell 0.3%, causing a bullish reversal in gold. But this week opened on a negative note for gold. 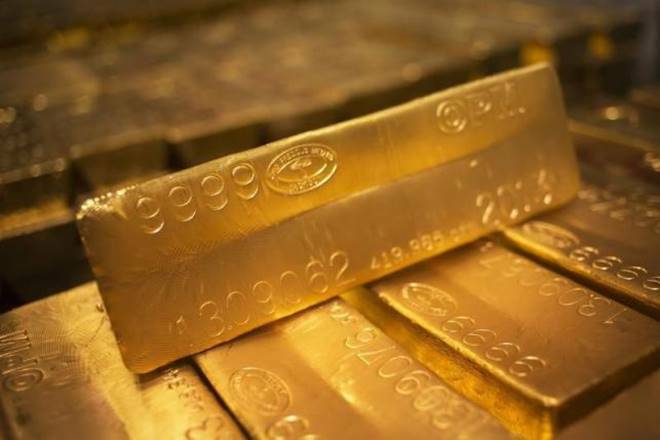 Gold prices edged lower on Monday as the dollar firmed after last week’s U.S. inflation data supported the Federal Reserve’s outlook for future interest rate increases. The dollar strengthened against a basket of currencies and extended its gains against the yen to hit a fresh six-week high of 111.06 yen, supported by the relative strength of the U.S. economy and on prospects of further rate hikes from the Federal Reserve. US dollar strengthens by any normalization of monetary policies thus weakening the yellow metal. The rise in price pressures will probably not shift the Fed from its stated path of gradual interest rate increases as policymakers have indicated they would not be too concerned with inflation overshooting its target. Gold is highly sensitive to rising U.S. interest rates, which increase the opportunity cost of holding non-yielding bullion, while boosting the greenback.